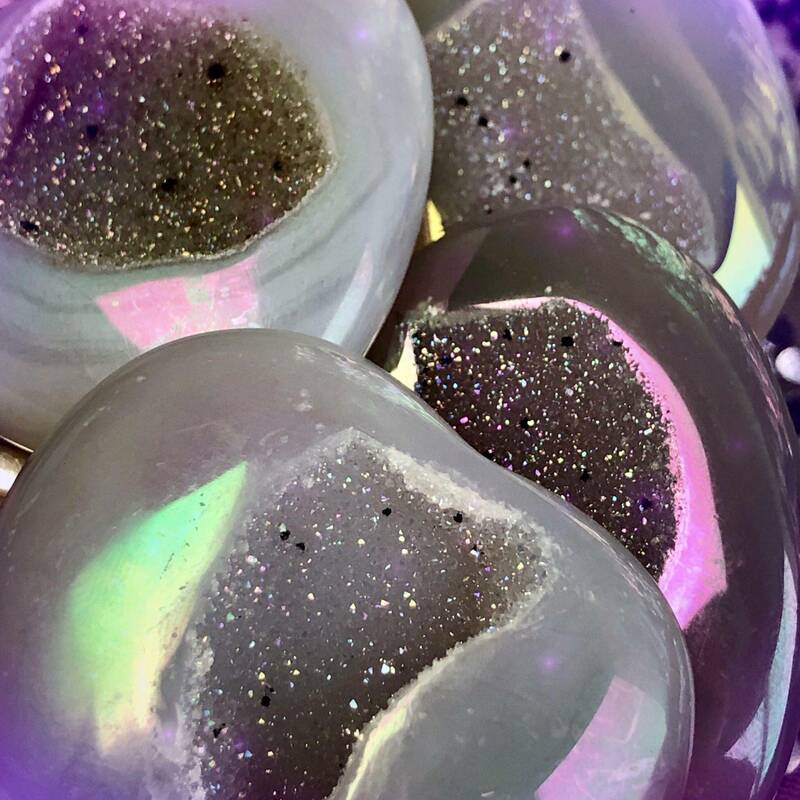 If these glimmering Angel Aura Druzy Hearts of Serenity are getting your attention, you must be on a journey toward peace and deeper spiritual connection with your guides and the celestial realm. 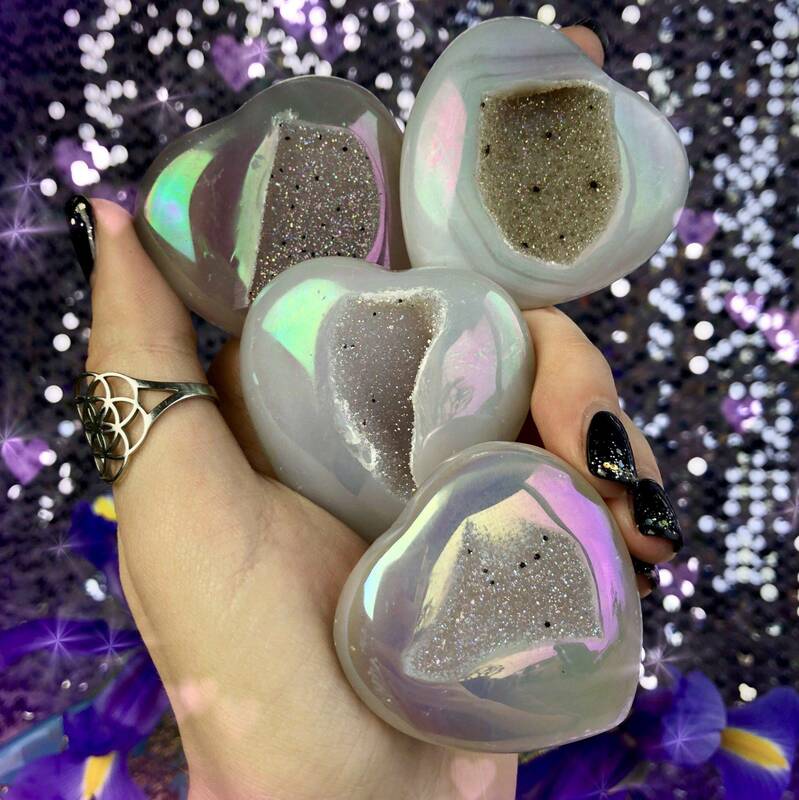 Iridescent like the angels they are named after, these Angel Aura Druzy Hearts of Serenity will enhance your natural intuition and insight while connecting you powerfully to the astral plane. It’s so much easier to let go of anxiety and disharmony when you’re connected with your higher self and receiving the love and infinite support of the higher realms. Bonded with platinum and silver (and sometimes gold and other trace minerals), angel aura quartz is essentially clear quartz with a few extra special powers. Like clear quartz, angel aura quartz helps with focusing, amplifying, and transferring energy. These hearts, with their iridescent reflection of brilliant rainbows, stimulate both body and spirit through their powerful vibrations. Angel aura quartz facilitates communication and connection with higher realms, spirit guides, and past lives. This gem will guide you beyond the Veil, opening the Crown Chakra, to develop and expose a whole new level of psychic and intuitive awareness. In the shape of a heart, angel aura quartz gains incredible powers in the realm of love. 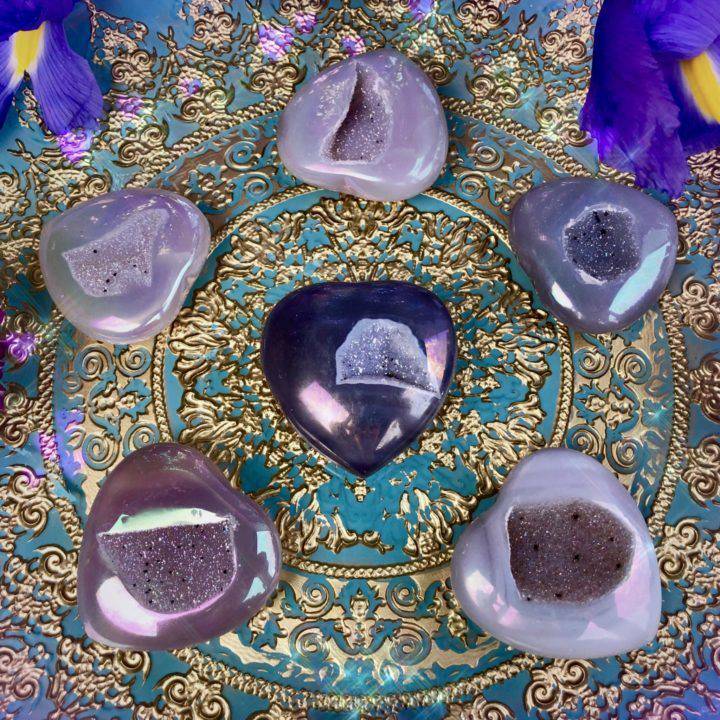 These Angel Aura Druzy Hearts of Serenity can be used to open and heal your heart space with the magic of the celestial realms. Hold yours in meditation, place one on your altar, or carry one in your pocket throughout the day to harness its enlightening energy. However you choose to use yours, know that you are held, supported, and illuminated in all that you do. And so it is. This listing is for one (1) Angel Aura Druzy Heart of Serenity (about 2”). Yours will arrive lovingly parceled along with a single leaf of white sage and a card describing the properties of this stone.